^ WoRMS. Ostreidae Rafinesque, 1815. World Register of Marine Species. [2019-02-06]. ^ 贝类海鲜营养价值，贝壳类海鲜营养成分，贝类海鲜锌. WebMD. [2019-01-12] （中文（中国大陆）‎）. 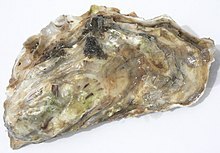 ^ Oyster. The Visual Dictionary. ^ 男子進食生蠔感染食肉菌死亡　食安中心：處理生蠔遭割傷或受感染. hket. 20 July 2018.